STORY SYNOPSIS: While orbiting a mysterious planet the passengers onboard the Jupiter 2 vanish one by one until only young Will is left. This episode begins with the spaceship in orbit around an unusual world whose atmosphere is 50% methane gas and therefore instantly poisonous to humans. According to the robot the other 50% is composed of an unidentified living gas, part of which has somehow left the planet and now surrounds the Jupiter 2. 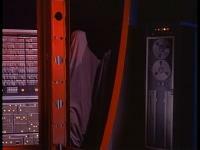 Don, John and the robot, manning the controls, are frozen in place, a huge shaggy hand materializes outside the viewport, the inner hatch opens and a blue gas insinuates its way into the lower regions of the spaceship just before the trio awaken from their artificially-induced slumber. Downstairs Will is a prisoner in his cabin thanks to a failed history test. This is a nice touch added to the script as it indicates the Robinson children were continuing their education while in space, light years away from the nearest terrestrial school. The robot is not allowed to help Will study for the make-up test so the mechanical man heads upstairs, leaving the boy alone to sulk in his room while Dr. Smith awakens from a nap in his. Just a few feet away in the ship's galley the Robinson women are cleaning up after breakfast. Maureen, standing by the washing machine/dishwasher, disappears! Penny heads upstairs to tell her father and he is incredulous to say the least. Since he cannot leave Don alone at the controls he grabs a microphone and orders Judy to come upstairs. She is the next to vanish, seemingly in-between decks on the elevator. Will and Smith, who have finally left their cabins, arrive just after Judy's disappearance and are told by John's stern voice to search the entire lower deck for the women-including the mysterious power core section. Smith pales and once again talks his way out of a dangerous situation, leaving Will to search alone.The verbal exchange between Harris and Mumy is fun to watch. Says Smith: "From the depths of Gehenna to the steps of the throne, he travels fastest who travels alone. Shakespeare." "It's Kipling," replies Will, "And you're just scared." Faithful viewers can see how Will has grown wise to Smith's scheming ways during their years together in space and although the young man is conned once again at least these days he catches on much faster. 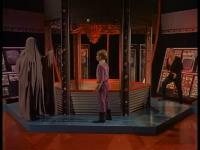 Of course the missing crew members are not in the storage room or the power core so Will exits the area, mystified. Upstairs the fog returns and the robot warns Robinson, West and Penny that something gigantic is walking across-and trying to tear open-the ship's outer hull! Once this has had its desired effect-creating tension and fear among the remaining members of the Robinson party, the gas goes away as quickly as it arrived. Professor Robinson still stubbornly believes his wife and daughter are on board the Jupiter 2 and organizes another fruitless search. The omnipotent eye of the camera allows the audience to to see the fate that has befallen Maureen and Judy-they are trapped in fog-enshrouded dimension. Are the others next? Don flies the Space Pod towards the planet then hurriedly returns to the relative safety of the mothership when the Pod erupts in sparks and smoke. The hatch to the smaller ship is opened after docking and Major West has vanished as well, a prisoner in fog along with the girls. As Don reunites with them the cause of all their problems finally reveals itself in the form of, of all things, a man in a sheet! Did writer William Welch, himself an 'expert' in matters of the spirit world and the author of several occult-themed paperbacks envision their adversary as a man in a sheet on purpose? One of the first things in life that young humans are afraid of are ghosts, and the most primitive way to represent one is to throw a sheet over one's head and yell, "Boo!" 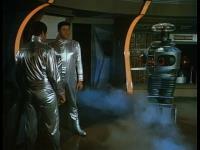 Or was this costume of sorts merely in keeping with producer Irwin Allen's tight budgetary purse strings? Or a little of both? As Mr Welch has sadly joined the ranks of the departed himself the answer will never be known for sure. The 'ghost' informs his prisoners he is still a child that need to grow with the help of the humans' most primitive emotion-naked fear. Now Penny is gone from the spaceship as well. More fear to feed on. Will, John and the robot are struggling to keep the Jupiter 2 from losing altitude (the result of the fog no doubt) and solve this eerie mystery at the same time and locate their lost loved ones. John and Will depart from the upper deck and head downstairs to search for Smith (who they finally notice is also missing). The mist and monstrous claw return with only the robot as a witness to this event, declaring to no one but himself that Smith has disappeared, too. 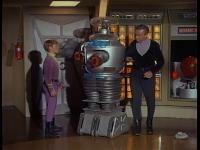 As Will's fear grows he realizes that his father and the mechanical man are gone as well! The boy is all alone with the unenviable tasks of keeping the Jupiter 2 from crashing, rescuing his family using his father's theory of reversing the oscillating units on the ship and meeting his fears face-to-face. The 'ghost,' as-yet unseen by Will replays the boy's verbal wish to be left alone as a way to taunt the frightened youth. 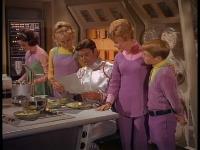 A very interesting camera angle is utilized in this episode only courtesy of the imagination of director Sutton Roley. The camera is inside the Space Pod facing outwards from the open Pod hatch from which two of the adult males have disappeared, almost as if something is hiding inside, enjoying Will's fright. On the fog world/dimension Dr. Smith begs to be freed as the 'ghost' feasts on his powerful human emotions and innocently (he is a child, after all) asks the Doctor to "Be more afraid," to which Smith replies. "I couldn't! I couldn't be more afraid!" in a terrified voice. The thing in the sheet plans to use the frightened man to get something he desperately needs..."something younger...stronger" like Will Robinson, who is at that moment pacing across the upper deck. Much to his surprise eerie blue bubbles begin to drip from the storage locker to the left of the main hatch, behind which Will discovers Dr. Smith has returned-or has he? This version of Smith has a deeper, more evil voice, and his facial expressions and demeanor indicate total, constant anger. A wrathful slap from the older man almost sends the boy sprawling to the deck when Will tries to prevent him from landing the spaceship. The vanished Professor Robinson's plan to get his family and friends back seems to have succeeded as the robot returns, a means employed by writer Welch to update Will on his family's predicament. The mechanical man is de-activated by the deadly Dr. Smith, now possessed by the malevolent being behind the trouble in which Will finds himself. In a suspenseful chase scene young Robinson is pursued to the lower deck where he frantically searches Smith's sleeping quarters for a laser pistol he's sure the Doctor has hidden. Afraid he will be discovered at any second he hides behind the cabin door as Smith searches the room then appears to depart unsatisfied. Just as Will (and the audience) thinks safety is at hand the door is yanked open by the demonical Doctor, revealing the terrified boy who uses his small stature to slip away from Smith and head for the power core, the last place on the ship he can hide. Upstairs John and Don return to the Jupiter 2 (the oscillator plan succeeds again!) and head below to save Will, who is now up against the wall of the glowing power core and has nowhere left to run. 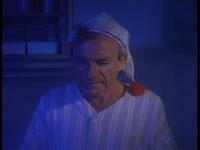 The evil creatures in Allen's shows often have to deliver a soliloquy before they attempt to dispatch their seemingly helpless victims and this one, in the form of the possessed Dr. Smith, is no exception, spouting some of the most hackneyed, inane dialogue that ever left Jonathan Harris' lips throughout the course of the series. 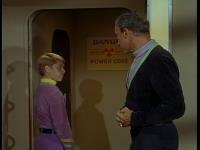 He is either a big mean kid or what Will Robinson will become in forty years as both explanations are offered. In one breath the Smith-Monster declares he does not know who he is and in the next, claims to be Will's ID in the Freudian sense. During this speech Will has faced his fears head on and is no longer afraid of the diabolical Doctor, who is reduced to his normal, shrieking self when the boy stares him down. From behind a surplus Time Tunnel computer comes the 'ghost,' his true appearance revealed as a man in a sheet at last to Will ("Where did YOU come from?" asks the boy, his fear suddenly returning momentarily). In order for the creature to stay alive Will must die! Following that logic Will makes another kill (remember the Cyclops in the unaired pilot?) and frightens the spectre into "hot" center of the power core, destroying it and saving them all by the time Don and John show up. The epilogue finds Will passing his history quiz, much to the delight of his family, and Dr. as Dr. Smith stumbles in and once again declares he will never miss another of Maureen's meals we fade out. 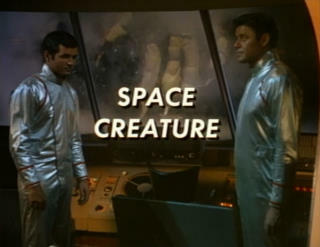 SCRIPT CHANGES: The working title was CREATURE OF THE VACUUM but in season three Irwin Allen went "Space" crazy ( with a total of eleven out of twenty-four season three episodes with the word in the title!) and so it was changed. Forget trying to explain how fog can be alive and intelligent. We'll make that one a given. And if the USS Enterprise can fight disembodied hands then, by golly, so can the Jupiter 2. But why does the hatch have to open before the gas gains entrance? And if both hatches had to open wouldn't the robot have made his second trip into space as he and the others were sucked out? Or did the gas follow the proper airlock procedure when coming in? When the blue fog enters Will's cabin and Smith's and speaks why doesn't either one think to alert Professor Robinson right away-especially Smith, who normally would have exited through the closed cabin door like Bugs Bunny in a movie at the first sign of trouble? John already knows the planet's atmosphere is deadly to humans so why does he send Don there in the Pod-without a helmet, no less? 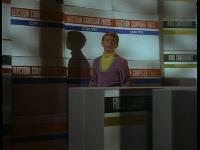 Are we to believe that Will Robinson has NEVER been inside the power core chamber before this? (He states this in the story.) Remember this is the kid who has consistently disobeyed his parents and placed himself in danger over and over again and after traveling for three years in this vehicle, sometimes for days or weeks at a time, never has even taken a peek inside wearing a protective suit? If he's such a junior scientist what is there to be afraid of? Granted the power core serves as a metaphor for the "haunted house" in the story (making the creature in the sheet its resident ghost) but it doesn't wash. 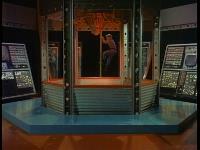 Which brings us to the most glaring error of all: the combination storage room/power core, which has plagued disciples of logic and blueprint makers everywhere for many years. Did Welch figure no one would notice that a ship that size couldn't possibly contain rooms that big? And if, by their third year in space they still had that many huge cases of "Food Concentrate" in the storeroom why were they always in danger of starving show after show? Food Concentrate is probably not the tastiest thing to eat but it's better than a fried boot. How come the robot doesn't know Smith has left the fog world when he talks to Will? He tracked everyone else correctly throughout the rest of the episode. Is there something different about Smith? He's also the only person transported to and removed from that place by the 'ghost-' twice!-but why? This is never explained. CONCLUSION: I must end this review by declaring that I do enjoy this episode very much which is why I kept my negative comments to myself till the end. There are plenty of genuinely spooky moments scattered across the episode like splatters of blood and even though it was telecast weeks after Halloween it's without a doubt the scariest episode of season three, if not quite one of the best from a logical point of view. But I still LIKE IT. In comes the fog and trouble for the Robinsons. Talking to fog...harder than talking to carrots? Dr. Smith wishes "they'd all just disappear." Mom Robinson is about to vanish. "You're just scared" at the entrance to the Power Core. Missing Robinsons meet a real space ghost. Great view from inside the empty Space Pod. Will against the deadly Dr. Smith. Space Creature meets his end.